Galley Wench Tales: Bucket List? Crash! Ouch. 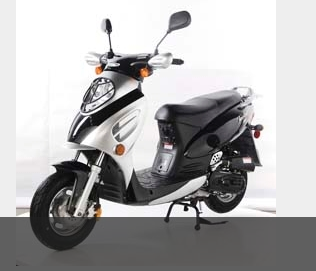 Scooter in same style as mine, pilfered from the TaoTao website. Don’t recall what prompted that classic line decades ago from Dad. It’s still spot on. Dad resisted bringing that one up when I deployed a bucket list wish (click here if you’re not sure what a bucket list is)* as a solution to my temporarily land bound commute conundrum -- riding a scooter to my West Marine job. The results were moderately disastrous. Without going into the embarrassingly stupid how it happened** the end result is a very small paint scrape on the scooter, but a broken wrist for me. I believe scooters don’t kill people, people kill people. Know anyone who wants to buy a lightly used scooter? By the time my cast is off, we’ll be cruising so soon after it doesn’t make sense to keep it. Jacksonville Shands Hospital tag atop my wrapped splint. Our friend Allen advice? “A 15 mile [well, it’s 13 ½, each way by backroads] commute in Jacksonville by scooter is too long. I’m sorry about your wrist, but that may have saved your life!” Admittedly, it was a long backroads ride. Off the cuff, the orthopedist who reset my broken bone said it typically takes 12 weeks to heal a broken bone. 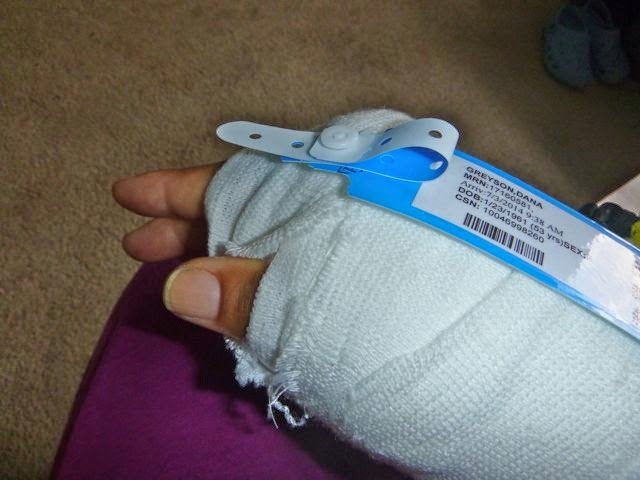 As we were one month away from employer-paid health insurance – uninsured -- I suspect the hospital’s financial damage will last far longer than the broken bone. This is my first blog post since breaking my wrist. Since my cruising season photos were FINALLY reinstated on my formerly ailing hard drive yesterday, watch for more upbeat retrospective posts complete with ohhhh – ahhhhh photos. “Canada” lot for hurricane season. It takes a while to do things with my left hand (and other appendages) only, as I broke my right wrist and am right handed. However, I’m looking forward to getting back on track with GWT blog posts, and am grateful West Marine is happy to keep me on as a one-handed checker, and that my virtual work for Finex, Dorigan & Assoc., Vancouver Family Magazine and various freelance work (like Cruising World shorts) is still do-able. Wayne too takes some gleeful pleasure in assisting me, particularly when it entails a derriere pointed up whilst my head’s draped over the tub when he wets my hair for shampooing with a European-style shower head. Sorry, no photos of that one. “Guess no endless showers,” he empathizes. Not counting two-ply toilet paper and fast internet, my two biggest landlubber indulgences are a queen-sized bed and irresponsibly long showers. One outta two aint bad, we conclude. One more reminder of feeling safer cruising on the water than getting around on land in civilization. *My bucket list is not driven by health issues but more by my philosophy that life is a terminal disease and to make the most of it while you can. **Readers – please help me come up with an amusing how it happened story that is not based on committing violence. July 8, 2014, temporarily land bound in Jacksonville, FL, USA. Journey’s on the hard in Green Cove Springs (N29.58.9 W81.38.8) until hurricane season ends in November. 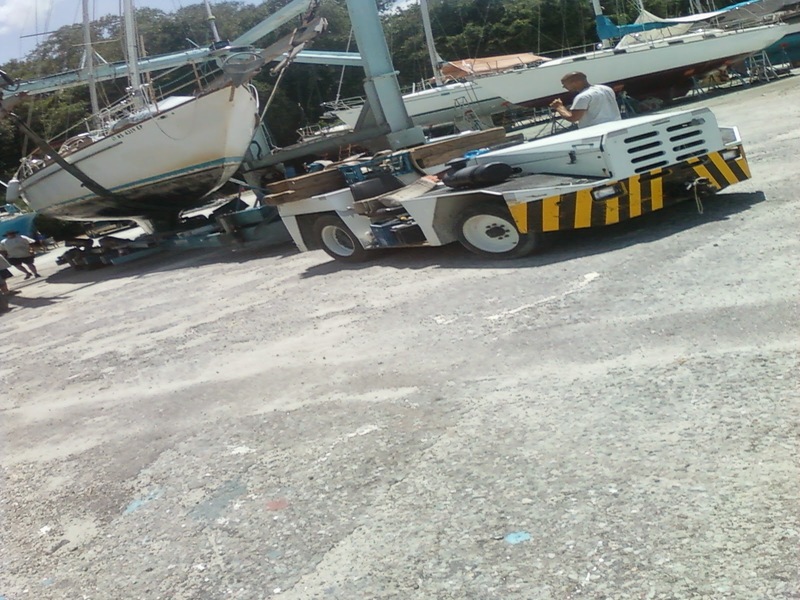 Then we do some boat maintenance and improvement and set sail for the South Pacific, through the Panama Canal. If it will make you feel any better I ran into a bus in Bermuda when test driving a scooter. A woman stepped off a curb in front of me and I turned to the left to avoid her but the little hell on wheels throttled up and I wheelied into the side of a bus. I took off with the bus driver yelling at me and my fingers swollen. Nice dent in the bus. Sorry about your wrist but like your friend said it may have saved you from further harm. It does. Thanks, Paul. BTW your most recent post http://lat43north.blogspot.com/2014/07/what-hell-are-you-doing.html totally cracked me up. You are one funny dude! 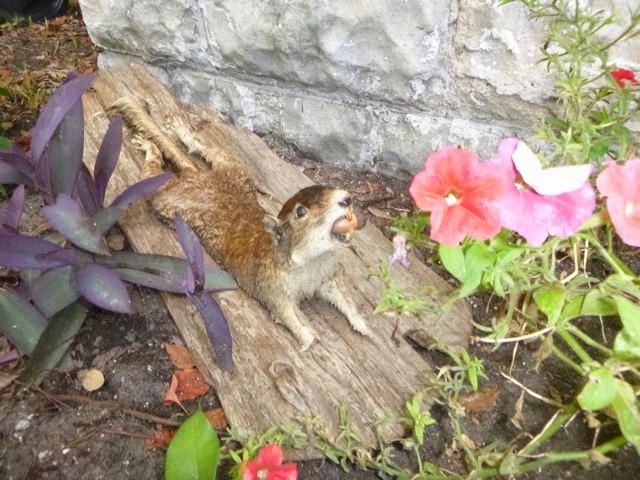 You could blame it on the squirrel. Maybe something along the lines of loving all of nature's creatures and using your scooter and your body as a shield to protect it from large ravenous birds... or cats? best response came from a West Marine customer the other day "fending off pirates"
Sending some healing energy your way! Thank you! So far doc says probably won't need surgery. Tomorrow they're recheck and hopefully switch me from a sling to a cast that frees up my elbow and more of my fingers. Ken, giving hubby ideas? Hubby is enjoying shower duty. We put a European style shower head on and a dry cleaner bag (about same size as trash bag) wrapped well gets me by with hubby's help.